A beautiful Irish Claddagh ring crafted in sterling silver, featuring the traditional crowned heart clasped between a pair of hands. 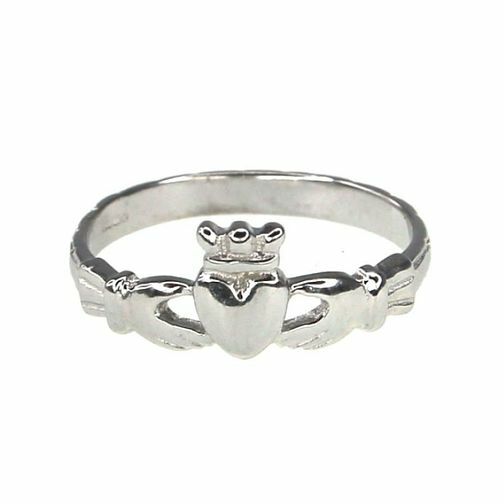 Dated back to the 17th Century, the Claddagh represents friendship and love, making this ring the perfect gift for a loved one. Ring size N.
Cailin Sterling Silver Claddagh Ring - Size N is rated 4.0 out of 5 by 1. Rated 4 out of 5 by Anonymous from Very pretty ring My daughter lost her Claddagh ring so I decided to replace it for her birthday. This sterling silver ring was so dainty (unlike chunkier versions) and she loves it as it is much more feminine:) The gift packaging was beautiful, wasn’t sure if it would be worth the extra money, but it was :) All in all a great experience and would order from H.Samuel again, without hesitation.